As a high-schooler tests his fresh superpowers on an unfortunate arachnid, is Josh Trank’s $15m feature debut issuing a sly challenge to 2012’s squillion-dollar spandex crew? Spidey and co better look sharp if so, because this found-footage flyweight matches advance heat with the clout to satisfy and subvert genre expectation. Co-opted from horror for sci-fi usage, the first-person format is energised to max emotion, immersion, invention and action. But a clever shift of genre focus adds what a superhero-stuffed market needs: the element of surprise. Humour and the human touch of characterisation cut through origin-tale cliché to start, as three dudes at a rave explore a freaky underground hole that grants them telekinetic powers. Steve (Michael B Jordan) is a sporty politico, Matt (Alex Russell) a brainy but emotionally stunted hunk. Matt’s cousin Andrew (Dane DeHaan) is our eyes, an outsider whose grim home set-up – sick mom, dipso dad, no money - has alienated him from life. Andrew’s disconnection drives his habit of viewing life through a camera, a point fully explored and exploited in Max ‘son of John’ Landis’s script. We understand his voyeurism and why others think it’s “weird”. We’re ecstatic that his prowess transcends shaky-cam cliché. That attention to persuasive detail continues as the trio test their powers in teen-dork style: heroism’s on hold while they goof about, blowing gusts up girls’ skirts and – hilariously - instilling fear of teddies in one moppet. 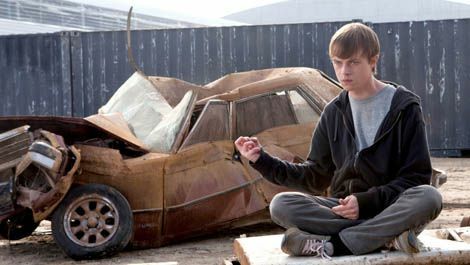 But Chronicle is no Superman -meets- Jackass spoof: it honours comic-book conventions by proving their adaptability to new contexts. Natural but vivid performances (from True Blood ’s DiCaprio-ish DeHaan, notably), class rage and darkening philosophical notions plumb depths and reel us in. Neither is it too lofty to excite. Some cheats with the first-person format occur: why Matt’s ex-girlfriend films her doorway is anyone’s guess. Yet they’re forgiven for the immediacy of the first flight scene and the thrillingly realised climax, a Carrie White-meets-Clark Kent cataclysm of money shots quick-cut from various recording devices (CCTV, iPhones) with no dilution of emotional focus. The crux of that focus is Andrew, around whom the origin-tale plot parts coalesce. Yet this “nerd with a camera” is a more complex, contemporary cove than Peter Parker. Stewed in a very now fixation on self-documentation, his great power comes with great concern for him and his mates. The summer’s incoming super-dudes should be feeling equally anxious: this bolt from the low-budget blue is going to take some beating.